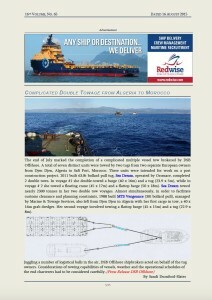 This press release, entitled ‘Complicated Towage from Algeria to Morocco’ was written for DSB Offshore Shipbrokers at the end of a complicated towage brokered by DSB Offshore Ltd. The press release was published in Towingline.com Vol 16 No.65 on 16 August 2015. To read the press release on the DSB Offshore Ltd website, Press release – DSB Offshore Ltd. Or download the pdf by clicking on the thumbnail image of the article attached. Please contact Sandi if you would like her to do content writing, editorial for your company or review a film or theatre production for your magazine, newspaper or production website.